A couple of notes leftover from my trip to Bedford three weeks ago:. My accommodations were great, at least for me, but you need an adventurous spirit to stay where I stayed. I won’t mention the name of the motel, because I would stay there again, and a very nice family runs the place. It’s cheap and convenient, and has the best wi-fi of any hotel at which I’ve ever stayed, but it is not exactly modern having been built in the ’60s, by my best guess. I may be off a bit, though. It could have been the 1860s. It was certainly built when people were smaller as evidenced by the accompanying photo of the bathroom. You can stand in one spot and use the toilet, brush your teeth, and shower all at the same time. Ironically, the marquee below the motel sign told people to “check out our new rooms.” Perhaps, the sign intended no irony; perhaps it simply hasn’t been changed since the motel was built. 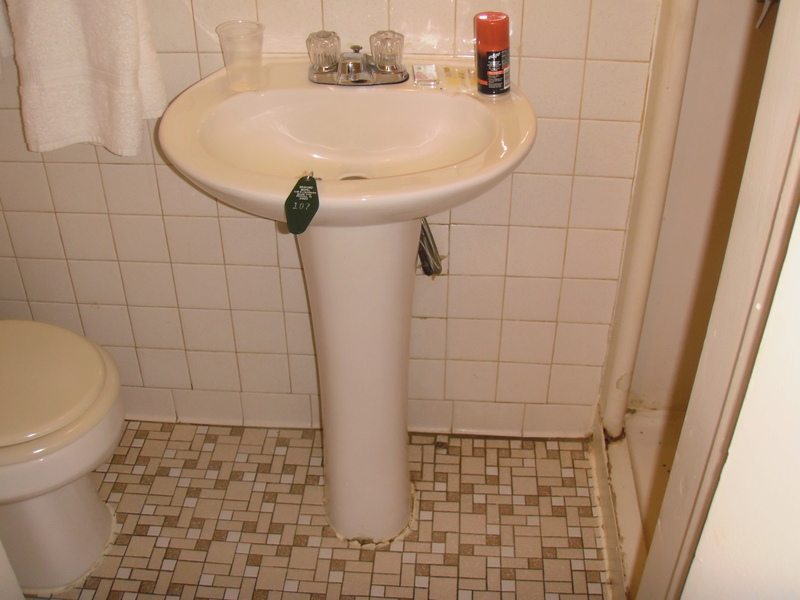 That little black tab on the sink is actually an old-fashioned door key. Remember how they used to say “Drop in any mailbox in the U. S. A.”? Of course, I had to pull on the knob and push on the frame and disparage the door hanger’s mother before it would actually close well enough to give any utilitarian purpose to the key. Still, the nostalgia of having an actual key rather than a door credit card more than made up for that annoyance. It’s always fun to experience little things such as these. That’s what turns a vacation into an adventure. This entry was posted in Uncategorized and tagged Applebee's, Bedford VA, tiny hotel rooms. Bookmark the permalink. The guy that was in the haunted house at Ocean City didn’t pop up out of that toilet while you were in there did he? No. There was no room for him. This is TOO FUNNY, Austin! 🙂 You want to know what I am ESPECIALLY noticing (I’m going to tell you anyway)? THE GRIME AT THE BASE of the ENTRANCE TO THE SHOWER!!!!! ugh! It’s most likely scrubbed as clean as one can get it … but the dirty CAULKING should be REMOVED and RENEWED! EEEAK, EEEAK EEAK! The bathroom was not at the end of the hall nor was it outdoors; I was satisfied! I hate to say this, but the bathroom looks like at least half the bathrooms in New York City. New Yorkers will be right at home there. I’d bet that once they stepped out of that bathroom, most New Yorkers would feel a little less at home! They’d feel welcomed, but perhaps a little odd in a place where no one is in a hurry and no one is a stranger.